Goodreads: High in the hills of Valencia, a forgotten house guards its secrets. Untouched since Franco’s forces tore through Spain in 1936, the whitewashed walls have crumbled, and the garden, laden with orange blossom, grows wild. Emma Temple is the first to unlock its doors in seventy years. Emma is London’s leading perfumier, but her blessed life has taken a difficult turn. Her free-spirited mother, Liberty, who taught her the art of fragrance making, has just passed away. At the same time, she broke up with her long-time lover and business partner, Joe, whose baby she happens to be carrying. While Joe is in New York trying to sell his majority share in their company, Emma, guided by a series of letters and a key bequeathed to her in Liberty’s will, decides to leave her job and travel to Valencia, where she will give birth in the house her mother mysteriously purchased just before her death. The villa is a perfect retreat: redolent with the exotic scents of orange blossom and neroli, dappled with light and with the rich colors of a forgotten time. Emma makes it her mission to restore the place to its former glory. But for her aging grandmother, Freya, a British nurse who stayed in Valencia during Spain’s devastating civil war, Emma’s new home evokes memories of a terrible secret, a part of her family’s past that until now has managed to stay hidden. Kritters Thoughts: Two storylines one in 1936 and one in 2001 and unlike others with dual narratives, these two storylines are easily intertwined and that isn't the unknown in this book. Three generations of women in this book - Freya is the grandmother who lived through a rough time in Spain, Liberty is the middle generation and as of the beginning of the story has passed away and it has affected both her mother and the final woman in this trio, her daughter, Emma, who is pregnant with the next generation and is trying to deal with a lot of changes in her life both personal and professional. The one thing that I adore about reading historical fiction is to learn something without feeling like I had a text book handed to me - the Spanish Civil War of 1936. I really didn't know much about this and don't tell my history teachers, but maybe I missed those days in school! Although I didn't know much about the war, I loved reading these chapters, they had story and content and history - so good! The 2001 storyline was just as good as the historical one and I loved that the reader knew how the storylines were connected so that mystery didn't take away from the real mystery of the book. Emma needed to learn the real history of her family and how they came to be before she gave birth and created the next part of the family tree. I love dual narrative books, but this one just had a little more to put it on the top of my dual narrative list! 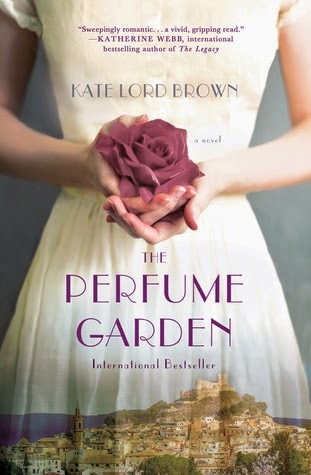 My first Kate Lord Brown book and not my last! I have now added her two other books to my wishlist! You didn't miss the Spanish Civil War in school, most US systems don't even mention it! A good movie that takes place partially during that time is Hemingway and Gilhorne. I may be off on that spelling. This book sounds great to me! Glad to know I didn't miss it, I thought I had missed that day!! Wow, this sounds great! I'm definitely going to read it! !